Simplicity is the way of life at Haridwar. The city reeks of spiritualism and traditionality. Haridwar stands as a gateway to important pilgrimage destinations like Rishikesh, Kedarnath and Badrinath. Haridwar is one of the most prominent and important pilgrimages in India. The essence of the place is etched deep in its spirituality and old world charm, of which Haveli Hari Ganga is also full of. 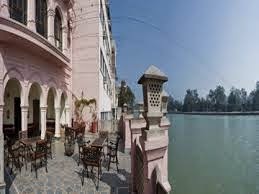 The hotel overlooks mesmerizing vistas of the ever-flowing river of the Ganges and the surrounding hills. The hotel provides lavishly furnished accommodation options in Haridwar. The old world charm of this Haveli combined with contemporary modern hospitality makes for a memorable holiday. Indulging in meditation and yoga in the serene surroundings of the banks of the Ganges fills your heart and soul with tranquility. Early mornings provide mesmerizing vistas. Indulge in ambrosial vegetarian delicacies at its in-house multi-cuisine vegetarian restaurant or exotic non-alcoholic beverages at the in-house Coffee shop. Visit the hotel’s massage and steam room where your worries wear off you and guests are restored with invigorating positive energy. For those who want to bathe in the holy water of the Ganges, the hotel has its own private bathing ghat to meet your needs. Guests also get an escorted visit to Har-Ki-Pauri during the evening aarti for which you need a prior booking. The rooms are supremely luxurious offering a decent stay and complimentary Internet connectivity. Book with Haveli Hari Ganga for your next visit to this holy city, you can also take advantage of the varied packages offered.